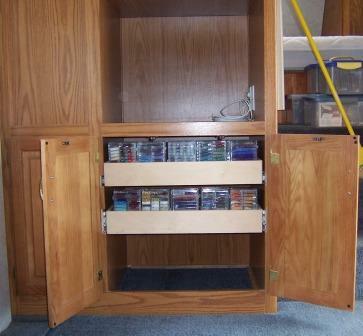 A Bead Storage Cabinet for an RV Boondocking Beadaholic. Seeing as how she is a long time Beadaholic, a Bead Storage Cabinet was one of the things Heidi asked me for when we talked of going full-time. I tossed it around for a while, and decided the best place was in the big cabinet under the TV compartment. It had been originally set up, by the Jayco factory, for the various electronic accessories you'd use with a TV, such as DVD player etc. We don't watch too much TV out in the bush, so the loss of that compartment, for that purpose, won't be much of an inconvenience. First thing I did was pull out the two tight shelves the builders of the rig had installed. Just no good way, that I saw, to utilize them as they were. I went into the shop at that point, rummaged around in my lumber stocks and came up with enough material to build the sides of a pair of drawers for the bead storage cabinet. 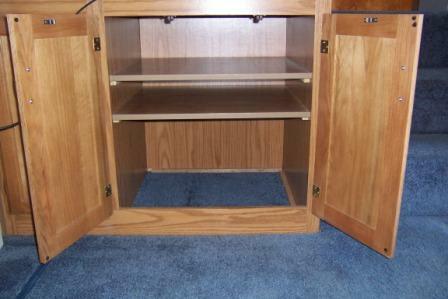 In a flash of inspiration, I noticed that the removed shelves would work fine for the bottoms of the drawers. So that's where they ended up... after a little whittlin' on 'em of course... right back where they started, only a little bit different. 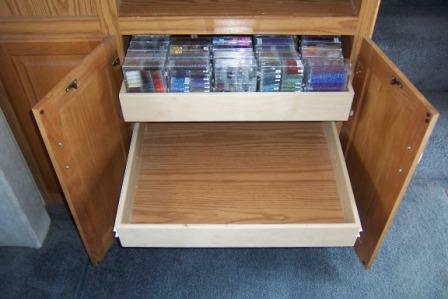 I needed a 1/2 an inch, on either side of the drawers, to give room for the drawer slides I had. Somewhere that got forgot and I built the drawers a mite too wide. Only left my self a 1/2 inch total. The original plan was to put in ledgers to bring the mounting locations for the slides up flush with the face frame of the factory cabinet. What I had to do though, since I built the drawers a mite too wide was just leave the ledgers off, and notch the face frame to give the drawer slides the clearance needed to extend. A Small thing, but you might want to remember the old saying I apparently forgot: "Measure twice.... Cut once!" Anyway, all's well that... ends without a fire! The drawers fit, and now Heidi has a Bead Storage Cabinet for 150 of her small bead boxes, with a good amount of storage underneath the drawers for other Bead Cases or maybe some of her Knitting doo dads. What might be a Bead Storage Cabinet for one, looks like a Fly Tying Cabinet for somebody else. 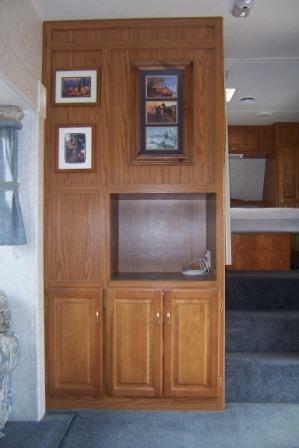 You can do an RV Cabinet rebuild like this to tailor your RV Cabinets to a variety of crafts and hobbies. Give it a mite of thought and you can figure out the setup that will be perfect for what you need in your rig. The more convenient and organized you set up your tools and supplies, the more you're going to enjoy what they're for. So don't quit your hobbies just 'cause you went RVing full-time. Go get organized and keep on RV Boondocking!